Infinity War left a lot of Marvel fans who saw it over the weekend rattled, with a number of chilling and shocking moments that many people did not see coming. As it turns out, one of the movie's most unnerving moments was completely improvised. Warning: Major spoilers for Avengers: Infinity War lie ahead. The entire ending of Avengers: Infinity War was absolutely creepy, featuring the death of about half of the MCU's heroes all shown at once. While many comic-book fans may have seen this coming, it was a moment that the average movie-goer did not anticipate, as most people did not expect to see the Earth's Mightiest Heroes actually lose. 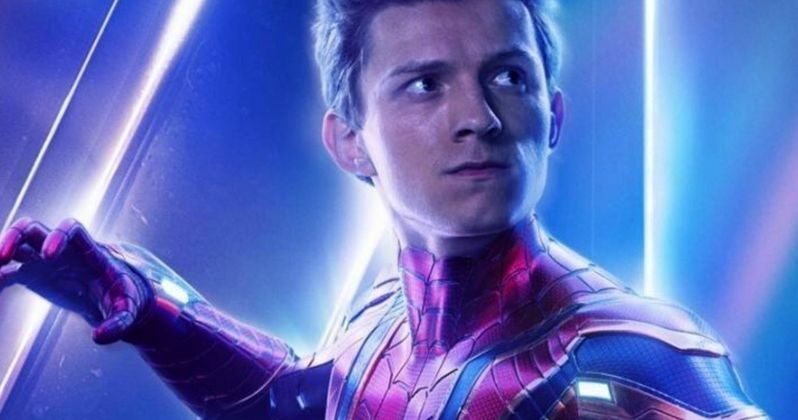 The death of many of the Avengers and most of the Guardians of the Galaxy was devastating, but one particular death that really made people tear up was that of Spider-Man. Instead of just disappearing in a matter of seconds like everyone else, Peter Parker's death was more drawn out. He started to limp, telling Tony Stark that he didn't feel so good. He ended up falling into Tony's arms, who laid him down on the ground as he cried, "I don't wanna go." His final words were, "I'm sorry," to Tony before he disintegrated into ash, leaving Tony Stark practically alone in a place he had never been. This was a beautifully tragic moment both for Tony Stark and Peter Parker, but as it turns out, this moment was improvised by Spider-Man actor Tom Holland. Infinity War co-director Joe Russo revealed in a Q&A session that none of Spider-Man's lines in this scene were written in the script. According to Russo, he simply told Holland that he "didn't want to die," and Holland rolled with it in what ended up being the movie's most heart-wrenching moment. This was a truly remarkable performance by young actor Tom Holland. The fear in his voice and face truly sold the emotion to the audiences who saw it, leaving arguably millions of Marvel fans in tears as they watched the terrified, high school-aged superhero fade into ash. It was a depressing moment that was certainly made even more depressing by Holland's truly fantastic acting. This isn't the first Marvel movie moment to be improvised by an actor, as many humorous moments in last year's Thor: Ragnarok and Guardians of the Galaxy Vol. 2 were improvised by the movies' cast. However, this is the first emotional scene in a Marvel movie to be improvised that we know about. This was more than just a joke, but an actually amazing performance, proving yet again that Tom Holland was the perfect choice to play Peter Parker. This revelation from Joe Russo, reported on Reddit, is just another reason for us to love Tom Holland, and to love Avengers: Infinity War. So much effort went into making this emotional roller coaster of a movie, and Tom Holland certainly played a major role in this. Hopefully, we will see more emotionally-driven performances like this in next year's Avengers 4. Does Far from Home Take Place Before Infinity War or After Endgame? Did Luke Cage Survive Thanos' Infinity War Decimation?